Mr. Squash and I have returned from 4 days at the Squash House. We intended to drive over a large rental truck with the contents of our storage room, but were met with an unexpected winter storm which dumped two feet of snow over the pass just before and during our drive over! It was agreed that the risk of taking the truck in those conditions was too great, so we threw a few things in the Pilot and off we went! It was an interesting 4 days filled with much to do as well as some unexpected circumstances! This is what our kitchen looked like when we walked in the door! We knew the old appliances would be gone - donated to a young couple who really needed an upgrade - but we didn't realize that even the kitchen sink was gone! Friday we eagerly awaited the delivery of the new appliances. What we didn't expect was our contractor telling us to have them delivered to the garage and not removed from their boxes! Oh my - I was disappointed by this - I really wanted to caress and drool over these! So here is how they look lined up in our knotty pine garage - just waiting to be moved into the kitchen! That same day about an hour later, FedEx pulled up with our butcher block counters! Ted, our builder, just happened to be home (he lives across the street) and saw the truck as well. It was a good thing, because not only was it a very long pallet, but it weighed 480 pounds and the driver said he wasn't allowed to put it inside. Well, as it turns out, Ted and the driver sort of know one another and the driver decided to help Ted drag the pallet into the garage - whew! We couldn't wait to see how they look, so Ted opened up the smallest carton and brought the piece into the kitchen. My picture is a little blurry, but you get the idea. All of the drawer and cabinet pulls will be replaced with brushed nickel. After that, Ted brought over his wife, Andrea, whom we had not yet met. When they walked in, I happened to notice that Ted had already installed our new light fixtures! Don't they look great? 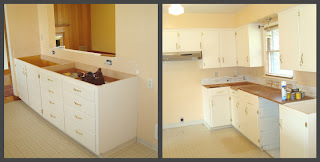 Two things I didn't get a chance to photograph were the new sink and fixtures - next trip they should be installed. And here is a photo of the new door in the dining area! The old one looked just like the door on the right. Ted did a really nice job of staining the wood to match the existing mahogany! The light fixture you see just a bit of in the upper left corner is going to be replaced with an antique craftsman-era fixture that we were given. 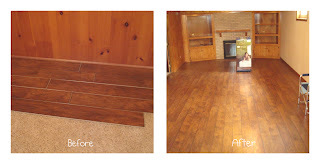 Below is a before and after of the flooring in our lower level. The photo on the left is one box of wood placed over the old carpet. It took a little getting used to at first, but now that we've seen it in light at various times of day, we really like it! Of course it won't stand out so much after the room is filled with furniture! We went to a large furniture store in Oregon looking for a new bed frame, and found a gorgeous set of Lane furniture to put in here. This room is going to be our TV/family room. The fireplace (partially hidden behind the box) is wood burning - one of two in the house. Here is Mr. Squash cleaning out the upstairs fireplace with our new "Ash Vac" given to us by his sister and brother-in-law for Christmas. What a handy tool - no mess, no fuss! Thanks again, Barbara and Bern, we really love it! The weather was fantastic - warm and sunny, so Saturday afternoon, we drove up to Bennington Lake which is only a couple of miles outside of town. This is a picture of Oregon's Blue Mountains on the road up to the lake. The green areas are winter wheat. This is heavy farming country! We parked the car next to an "alleuvial cliff" and noticed a bunch of holes in the side of the cliff. Wouldn't you know - there was a large owl in one of them! Click on the photo for a better look! Here is how the lake looked. You can see some freshly plowed fields from the center to left. Lots of people were fishing as well as several Osprey who were also looking for a catch of the day! Finally, here is a photo of one of our new maple trees! They both wintered well and are beginning to leaf out! I have a little more show and tell, but will save it for tomorrow. While we were gone we had a showing of our house. Today, they came back for a second look! This is encouraging, but we won't get our hopes up just yet! How exciting to be able to follow your progress in your new nest..speaking of which..love the shot of the owl..how cool is that..
What lovelt photo's, I love your new timber floor. Now I'm a little confused, I thought your "Squash House" was in the State of Washington? Forgive me I'm yet to get my head around all the US states. Your home is truning out just like you pictured it. It will be warm and inviting. I love the nature shots. Here in Illinois, we have miles of corn fields, the mountains are just beautiful and thw owl, how wonderful. Your home is absolutely beautiful! It's fun to see all of the different stages! I hope you will get everything installed in your new home without too many adventures. It looks like a lovely place to live. Enjoyed all your photos and reading about the progress of The Squash House. I see the planets were aligning on many levels for y'all. Not perfect but still, alignment. Enjoyed the owl photo, too. Thanks for sharing. Well if those aren't beautiful appliances sitting in the most gorgeous garage ever. :o) Your new house is going to be a very lovely home. Great owl pic when I clicked to enlarge! Your new house and the area surrounding it are just beautiful. LOVE the wood floors! Fingers crossed for a quick sale! squash house is going to be fabulous! and the scenery is to die for...i'm glad you said to click on the owl pic...couldn't see him in the little pic, but the big pic is awesome! fingers still crossed on selling your house! The house is coming along beautifully! Love the light fixtures and flooring you've picked out! Both my fingers and toes are crossed for y'all Candace. Sounds promising. The scenery is breath taking. What a beautiful part of the country. Does the snow disappear from the mountains in the summer months? It's so exciting to get a new home ready. I hope the lookers turn into buyers so you can make the move when you're ready. I know you are so excited to get into the Squash House. Thanks for sharing. Love those wood floors. The nature photos are beautiful. The owl photo is so cool. Love the pictures Candace and soon, you won't have to worry about crossing over the pass! Oh the new Squash House is looking fabulous! What an incredible journey. Everything looks beautiful. I especially love the wood floors. My husband and I want to do that to our home, but with a medium sized dog and grand kids who like to run Hot Wheels along the floors, I'm not sure if wood floors would be the best for us. I love the picture of the owl. Good luck to you selling your home. Your new home is exciting, but I am kind of interested in knowing more about the one you are selling. I am about your age looking forward to spending the future with my fisherman and getting out of the bay area to some place a little slower paced and close to where he can fish to his hearts delight and I can quilt and garden. So where is your home that is for sale? Does it even come close to our needs? I'm loving what you guys are doing here Candace, it looks great... I ADORE butcher block counters! Candace, everything looks so neat! I love butcherblock, I am hoping for my own in the future. 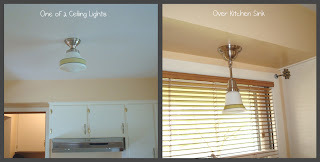 I really like your light fixtures, and I agree a second look is good news. At least they didn't write you off after the first look! Good luck selling!!! How exciting and how pretty. I love your new kitchen so far and the wood floors and fireplace. Beautiful!!! !